Many workplace pension schemes are what are known as ‘defined contribution schemes’, i.e. those where contributions (from both employer and employee) are determined by the level of earnings of the employee. When an employee takes parenting leave (i.e for Maternity, Paternity or Adoption) then their pay may change (and will often be lower) during the period that they are away from work. Employee contributions should be based on the actual level of pensionable earnings of the employee during their parental leave. This is easy for Payroll Manager to calculate, and is done automatically by the software once details of the parenting leave has been entered. Employer contributions should be based on pensionable earnings of the employee before they started their parental leave. Payroll Manager is not able to calculate this figure automatically (see reasons below), and adjustments to employer contributions should be made manually on the ‘Pay Details’ screen in order to ensure the correct level of employer contributions are being made. HMRC have rules in place which determine how much SMP/SPP/SAP an employee should receive whilst on parenting leave, based on the earnings of the employee during a set period leading up to the start of their leave. This involves a calculation to determine the average weekly pay of the employee, on which the SMP/SPP is based. (You can see this calculation by clicking on the ‘Reports’ button on the ‘Calendar’ screen in Payroll Manager and selecting the ‘Parenting’ report). Unfortunately, there are no similar rules in place to determine what an employee’s ‘normal’ pensionable pay was prior to them going off on leave and therefore no set method of calculating what the employer pension contribution should be during their leave. In situations where an employee is paid the same regular amount per pay period before going on leave, it may be reasonable to assume that the employer should base their level of contributions on this same amount whilst the employee is away on leave. The situation becomes more difficult if the earnings of the employee were variable in the pay periods leading up to their leave, as there is no published guidance on how to calculate the ‘normal’ level of earnings in these circumstances. Moneysoft has sought advice from HMRC, The Pensions Advisory Service, The Pensions Regulator and various pension providers on how to calculate the correct level of employer contributions in cases where an employee’s earnings were variable before commencing their leave, none of whom have been able to provide a definitive answer. For this reason it is not possible for Payroll Manager to automatically calculate employer pension contributions during periods of parenting leave, and this is something that must be done manually by the user. You should contact your pension provider for advice, as they have a legal obligation to ensure that the correct level of employer contributions are being made during periods of parental leave. Once you have determined what the employer pension contribution will be during an employee’s period of parenting leave then you should manually enter this on the ‘Pay Details’ screen (as below). 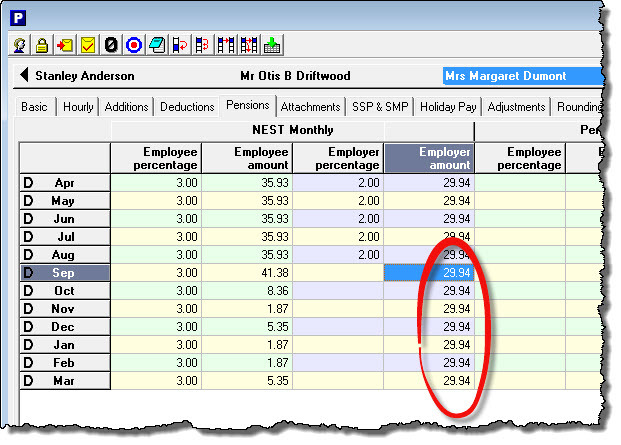 Click on the ‘Pensions‘ tab on the ‘Pay Details‘ screen in Payroll Manager, and select the relevant employee. Click in the ‘Employer amount‘ column for the first pay period during which the employee is on leave and manually type in the employer amount. Press ‘Enter‘ when you have finished. You will see that the ‘Employer percentage’ figure (if any) disappears for this particular pay period. Repeat this for all pay periods that the employee is on leave. In the example below, the employee contribution is set to 3%, and the employer pension contribution is initially set to 2%. The employee is on maternity leave from September through to March, and so the ‘Employer amount’ has been manually entered by the Payroll Manager user during these months so that the actual employer contributions remain the same as they were prior to the commencement of parenting leave. (The employee percentage remains at 3%, so employee contributions to the pension scheme are lower during the period of leave). Q. What happens if the employee choses to take additional, unpaid parental leave? A. Currently an employee is entitled to up to 39 weeks paid parental leave, but they can if they wish take an additional 13 weeks unpaid leave. There is no obligation for either the employee or the employer to make pension contributions during this 13 week period, unless the contract of employment or the rules of the specific pension scheme states otherwise. Q. What if the employee doesn’t qualify for SMP (e.g. perhaps she has not been with the employer for long enough) – does the employer still need to make contributions during the leave? A. The suggests that the employer should make contributions for the first 26 weeks, although you should speak to your pension provider for clarification of their particular scheme rules. The Pension Advisory Service gives more details on pension contributions during periods of parenting leave.